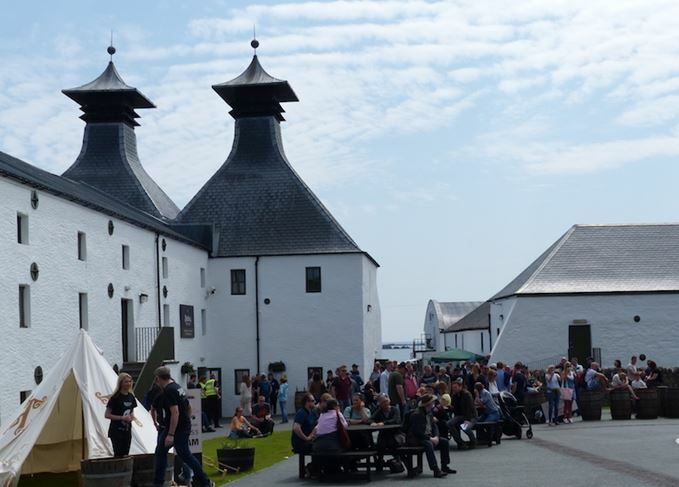 Distillery open days, music, dance and a host of other events are the focus of this year’s Islay Festival – Fèis Ìle – which gets under way on Friday. The Islay Festival of Music and Malt celebrates the culture, history, music – and whisky – of Islay, the Queen of the Hebrides, with all eight distilleries (and neighbouring Jura) joining in the fun. Scotchwhisky.com will be on Islay for the duration of the festival, filing daily reports and video footage from the distillery open days, and tasting all of the prized Fèis bottlings (there are a total of 14 this year). The whisky fun doesn’t begin and end with the distillery open days, however. A varied array of events includes a whisky nosing and ceilidh night at the Ramsay Hall in Port Ellen, whisky tasting with Islay legend Jim McEwan at Ballygrant Hall, and whisky and cheese pairing with the Rare Malt Whisky Company. There’s also a pop-up whisky bar run by The Whisky Exchange at the Ramsay Hall from Tuesday, 30 May to Thursday, 1 June, open from 6pm to 11pm and offering more than 75 Islay whiskies. Big Peat owner Douglas Laing has events planned at various venues around the island, the Scotch Malt Whisky Society is holding a free garden party at the Islay House Hotel, and The Vintage Malt Whisky Company is supporting an open day at the Finlaggan Trust. Beyond whisky, there are ceilidh dance lessons, fly fishing competitions, concerts, folk music and bowling competitions – and much more, including the Islay Ales open day. Check out the Islay Festival website for more information. The Islay Festival began in 1984, amid fears that the Gaelic language and culture were becoming endangered. What began as a drama festival has since mushroomed into a celebration of all island life and culture, including its most famous export: malt whisky.